Join Body Brave and Metta Made in Hamilton as well as 3 other vendors, PFHco @pfhco (https://www.etsy.com/ca/shop/PFHco) with their handmade ceramics and wood items, NwHbts New Habits with their upcycled handmade bags and products and Pam Carson and her beautiful watercolor paintings, for a Holiday Market! 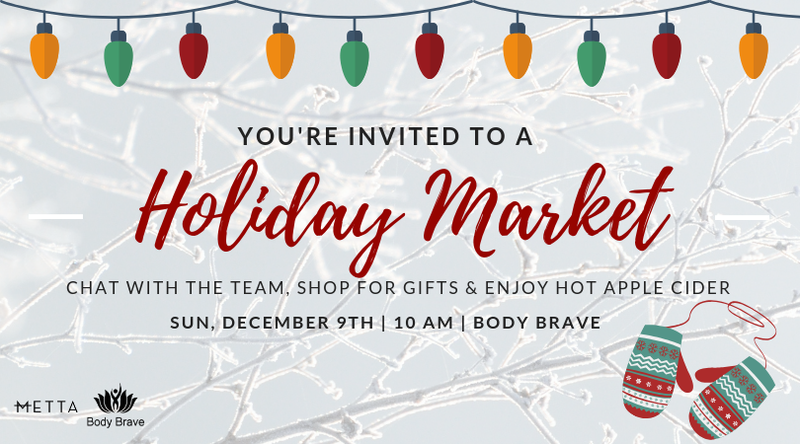 Come check out the Body Brave space, meet the team and board and find out more about us! Metta Made in Hamilton (www.mettamadeinhamilton.ca), a local body inclusive clothing company will be there! Try on some clothes and get some gift shopping done! There will be hot apple cider and snacks. Part of the proceeds from the event will go towards providing programming for those struggling with eating disorders. Don't miss this fun event! 10am to 3pm, 1047 Main Street East, Hamilton.